Two years ago nobody knew her name. Two years ago nobody knew her name. Now, millions of tweens around the world follow actress Sofia Carson, and the young star is set to host the wildly popular Radio Disney Music Awards on April 30. Carson recently stopped by the ABC News studios in New York to talk about her whirlwind career as she preps for the RDMAs. Carson's career skyrocketed when she snagged a role in Disney’s made-for-TV movie, “Descendants.” Carson played Evie, the daughter of the Evil Queen. The movie quickly became a go-to favorite for the Disney crowd. (Disney Channel via Getty Images) The teenage sons and daughters of Disney's most infamous villains star in Disney's "Descendants," a live-action movie that, with a knowing wink at traditional fairy tales, fuses castles with classrooms to create a contemporary, music-driven story about the challenges in living up to parental and peer expectations, June 23, 2014. "It really felt special. It was also my first movie and my first really big job so everything for me was just magical like out of a movie," Carson said. She went on, "Working with Kenny Ortega (director, choreographer), working with an amazing cast, to play the daughter of the legendary Evil Queen, all of it was very surreal. And I know that we all felt that we had something special on our hands, but I definitely did not anticipate or ever imagine the scope of what 'Descendants' has become thanks to fans who have fallen in love with the character and taken it beyond what I ever imagined. Evie really changed my life. And now we have the sequel. I’ve been able to shoot four movies since that film. It launched my career." “It was surreal. Growing up I had always sung and been in dance lessons. But I’d never really performed like that before, being on stage singing and dancing at the same time,” said Carson. (Radio Disney via Getty Images) Entertainment's brightest young stars turned out for the 2016 Radio Disney Music Awards (RDMA), music's biggest event for families, at Microsoft Theater in Los Angeles, on April 30, 2016. She recently released her second single, "Back to Beautiful," earlier this year. The video has already racked up nearly 9 million YouTube views. It follows a terrific debut of Carson's first single, "Love Is the Name." Carson is set to take the stage this year hosting the Radio Disney Music Awards alongside Kelsea Ballerini, Jordan Fisher, Alex Aiono and Jenna Ortega. Carson said, "I’m excited. I’ve always wanted to host the show. Zendaya hosted two years ago and she was fabulous. And I was like, 'Oh it would be so cool to host the RDMAs. So I’m really excited. It’s going to be so much fun. There’s amazing, amazing performances. We get to honor the iconic Britney Spears. So it’s going to be a really special show." In her movies, TV shows and music videos, Carson appears to be living the high life. But she likes to keep it simple when she's not performing. “I always say that I’m pretty boring. I’m not that exciting. I’m home watching Netflix, going to the movies. I don’t really do exciting things. I think that’s the nice thing, whenever you have down time. I love being with my sister. We live together and I love her so much. So being with her, watching Netflix, going to the movies, yeah, that’s my thing,” she said. Here's Sofia with her sister Paulina. “I stay healthy most of the time. But on my cheat days I love Italian food. I love pasta. Bread and olive oil and cheesy pasta. I also love chicken fingers and French fires. I also love frozen yogurt and sour candy,” she said. 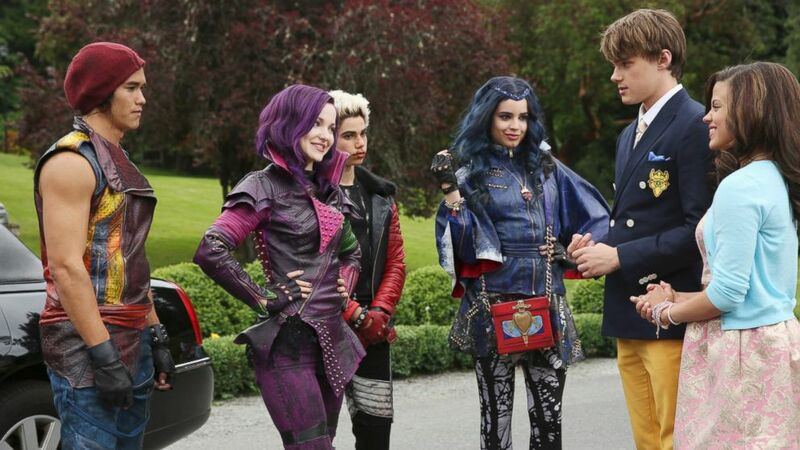 "Descendants" fans already know the sequel to the smash hit is coming this summer. Carson offered three hints about what to expect. “There’s really amazing music. There are two numbers you should watch out for, two numbers that I really, really love; Evie’s fashion, and there’s a really beautiful story of friendship between Mal and Evie, like a sisterhood," she said. You can watch Carson hosting the Radio Disney Music Awards Sunday, April 30, on the Disney Channel.